GM Mesgen Amanov was unstoppable this weekend at the Midwest Class, winning the Masters section with 4.5 points and racking up victories against fellow GMs Dmitry Gurevich and Alex Shabalov, before holding on for a draw in a worse position with GM Mark Paragua in the final round. Amanov makes his home in Chicago, where he is a highly regarded chess coach and also the area's youngest grandmaster. He recently returned from the Olympiad in Siberia, where he represented his native country of Turkmenistan. Perhaps playing against that high-level competition helped sharpen his game. His stellar performance this weekend helped him gain 35 rating points, no easy feat for a player over 2500, bringing him to a personal high of 2553. Mesgen kindly annotated two of his key Midwest Class games for CLO. After an unusual opening we reach a stonewall pawn structure. 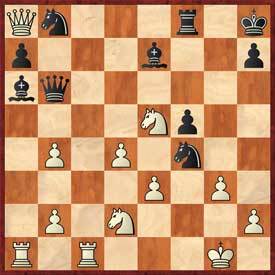 Here I decided to take a pawn on d5 when Black's only reply is to recapture with the c-pawn since exd5 loses the pawn on f5. A very strong move, forcing me to block my bishop. I think this is my only chance to fight for an advantage. It looks dangerous because I have to sacrifice my bishop, but all complications are on my side. 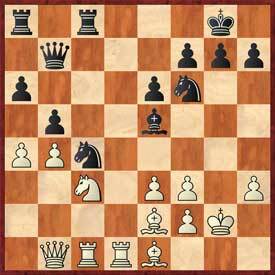 I think this move is a mistake; Shabalov played it very quickly. 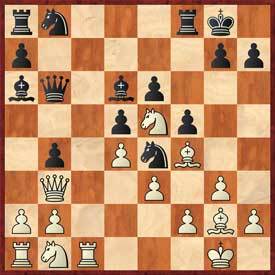 Now I have the threat of Bxd5 and at the same time, the bishop is hanging on g5. The only chance! If gxf4?? Rg8+ and White loses. The computer doesn't like this move and offers Ndc4 with a big advantage. White still has a little edge after the text, according to Rybka. The last mistake. After 24...Nxa6 25.Rc8 Ne6! 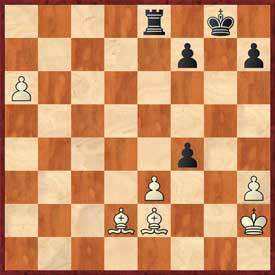 (the move I missed), it looks like the endgame is equal after 26. 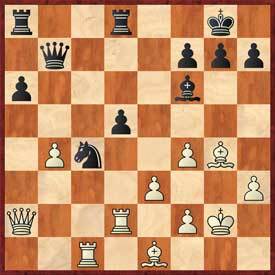 Nd7 Rxc8 27 Qxc8+ Qd8, but White remains better after 24...Nxa6 25.Rc8 Ne6 26.Nec4 Qb5 27.Qxa7 Rxc8 28.Qxe7 Qe8 29.Qf6+ Kg8 30.d5. 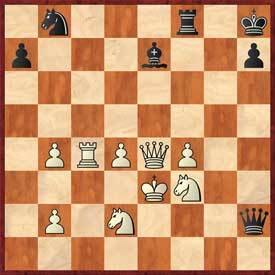 According to Shabalov this is the move he missed. I wasn't familiar with this move but it has been played once, according my database. The only thing I remembered was that I can't play Bb7 due to b4! 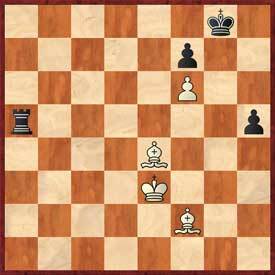 Eljanov-Aronian continued with a4! 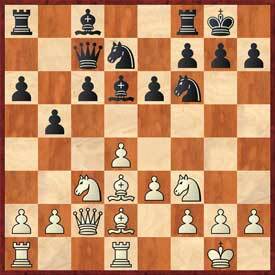 My engine doesn't like this move and recommends 18...bxa4 19 Nxa4 Bc6! 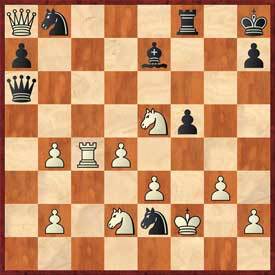 with a good game for Black. This is also good enough to equalize. 19.gxf3 Ne5 20.Be2 Qb7 21.Kg2 Nc4 22.Be1 Be5? I think this is a blunder. My opponent missed 23.axb5 axb5 24. Nxb5! Qxb5 25 Qd3!. The problem is that I can't take on e3 with check, because of Qxe3 and both my queen and bishop are hanging. 23...Nd5 24.Nxd5 exd5 25.f4 bxa4?! I needed draw in this game to secure clear first place, so I decided to repeat, but my opponents had another plans. Another mistake. 31...Be7 would be much better. 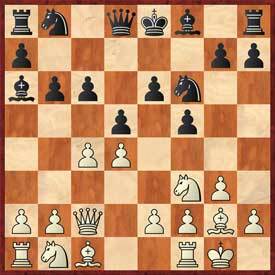 36...Ree8 37.Ra7 Rb6 38.Be2 Rg6+ 39.Kh2 Rf6 40.Bd2 g5 41.Rxa6 Rf5 42.Ra5? This move looks very strong, but I had something in mind! 42...Rxa5 43.bxa5 e3! 44.fxe3 gxf4? 44...Rc8! would be the best, luckily for my opponent didn't recognize the difference. Kg2 would win, but all these moves are easy for a computer! Amazing move! I failed to find any chance for White to win after my move! White remains better, but I think this is already a draw. On what may have been the last beautiful fall weekend of the year in Chicago, almost 240 chess players opted to spend it indoors, battling over the board at the Westin Hotel in Wheeling. The turnout included many of the Midwest's top junior players. This meant that many of their parents, instead of enjoying the sun's warm rays, could be found camped out in the windowless, poorly lit corridor outside the tournament hall. But no one seemed to be complaining. "My kids have learned so many life lessons from chess," reflected Dr. Susan McClanahan, a psychotherapist whose three children, Gavin, Bryce and Emily, were all playing. Gavin and Bryce have been long been ranked as among the top players for their age group in the country, and younger sister Emily has made impressive gains in her performance in the last few months. Perhaps most important, says their mom, is what they've learned about the amount of effort it takes to do something very well. "They've learned that to improve and to be really good at something, you really have to work at it." The junior players were among the biggest gainers in rating points this weekend, and some saw a considerable boost to their piggy banks as well. Ten-year-old Conrad Oberhaus's clean sweep of the Class B section netted him 80 rating points to a personal high of 1866, along with a check for $1,278. The Class B section saw several strong performances by the age 11 and under crowd. David Peng, already the country's #2 ranked 7-year-old, finished with 3.5 points to boost his rating by 72 points to a new high of 1743. Nine-year-old Matthew Stevens and 11-year-old Bryce McClanahan also finished with 3.5 points and had rating gains of more than 70 points each. In the expert section, teenagers Emily Tallo of Indiana and Sam Schmakel of Illinois, who were both playing up, finished with 3.5 each and broke 2000 for the first time. In addition to rating points and money, many juniors earned the respect and admiration of players many years their senior. After the tournament ended, retired engineer Daumants Hazners, who tied for second in the Class B section, came to visit with Bryce's dad. "Your son was the only one who beat me," Hazners said. "He wiped me all over the board, but he played so well I didn't care. It was a beautiful thing to see." For Bryce's mom, one of the beautiful things about chess has been the camaraderie across generations. When her boys first started playing, they had a hard time handling their losses. But seeing older children and adults who handled losses with grace and good sportsmanship, along with lots of practice losing, helped them get over that hump pretty quickly, McClanahan noted. "They go over the games with the person they lost to, and the winners are generally so nice to the losers and show them what they did wrong or suggest other ideas," McClanahan said. "It's an amazing thing to see." See Andrea Rosen's story on the US Junior Closed in the current (October 2010) issue of Chess Life Magazine. Check out the USCF MSA crosstable here.